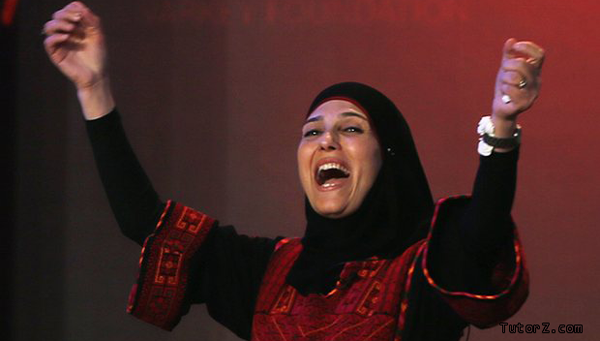 A Palestinian teacher Hanan al-Hroub has been awarded the $1m Global Teacher Prize for her contribution at a star-studded ceremony in Dubai. The ceremony took place at the Global Education and Skills Forum. There were 10 finalists from the United States, UK, Pakistan, Kenya, Palestine, Japan, Finland, Australia and India. They were invited on stage by a video message from physicist Stephen Hawking and congratulated by video messages from former US president Bill Clinton and US vice-president Joe Biden. Hanan al-Hroub specialises in supporting children who have been traumatized by violence. She went into primary education after her children were left deeply traumatized by a shooting incident they witnessed on their way home from school. Al Hroub uses an approach with children that she developed herself to build trusting, respectful and affectionate relationships and encourage children to work together. “I am proud to be a Palestinian female teacher standing on this stage. I accept this as a win for all teachers in general and Palestinian teachers in particular”, Al Hroub said. The ceremony was attended by Hollywood movie stars, Salma Hayek and Matthew McConaughey as well as Indian movie stars Akshay Kumar, Abhishek Bachchan and Parineeti Chopra. Hanan al-Hroub will receive $1m and will be asked to serve as a global ambassador for the Varkey Foundation, non-profit organisation set up to improve the standards of education for underprivileged children throughout the world. TutorZ’ team wants to congratulate Hanan al-Hroub and thank every teacher/tutor who works with us and helps children to overcome their study difficulties. Each tutor on TutorZ provides a welcoming, safe environment which enables students to achieve high standards and make good academic progress. This entry was posted in News and tagged Bill Clinton, Global Teacher Prize, Hanan al-Hroub, Stephen Hawking, study difficulties, teacher, tutor, US vice-president Joe Biden, Varkey Foundation.